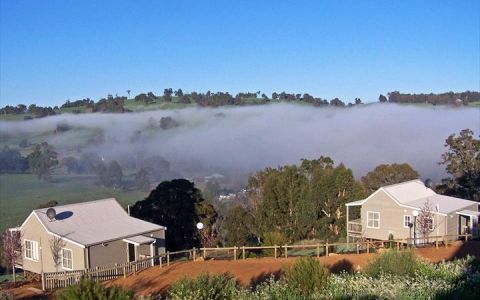 Balingup Heights offers a range of fully contained accommodation from 1, 2 or 3 bedroom alpine style cottages. The Cottages offer the utmost in privacy and seclusion, each set apart in the hilltop forest. The spacious decks provide the perfect place to relax and enjoy the views - misty mornings and spectacular sunrises and sunsets. Ideal for families and walkers, this cosy cottage has 2 bedrooms and sleeps up to 5 persons. Bedroom 1 has one queen & one single bed, Bedroom 2 has two single beds. Hepton Hill is fully self-contained and provides air conditioning, a cosy wood fire, TV/video/DVD, CD player, microwave, fridge, gas top cooking and BBQ. Please note TV reception is not available in this Cottage due to its location on the hill. An additional person can be accommodated on a fold out bed - please contact us for details. 1 x Q/s room with a single bed; 1x twin room - 1 bathroom - large balcony opens off living room with views over the valley. No TV reception available from this cottage but CD/DVD/etc avail. Twin share extra charges apply. Perfect for couples looking to relax. Elevated and spacious balconies with views that are just beautiful! Cosy and comfortable with full insulation and a wood fire, Kimbas Cottage sleeps 2 people in a Queen size bed. Additional people can be accommodated on fold out beds if required - please contact us for details. 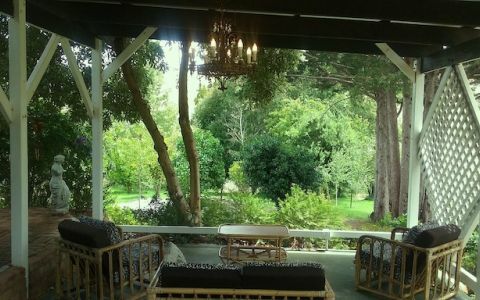 Kimbas Cottage is fully self-contained. Air conditioning, a cosy wood fire, electric blankets, crisp freshly laundered linen and guest towels plus complimentary tea and coffee all add to the home comforts. Cottage has a q/s bedroom and a sofabed in the living area which will accommodate 1 adult/child. 1 bathroom. Twin share extra charges apply. 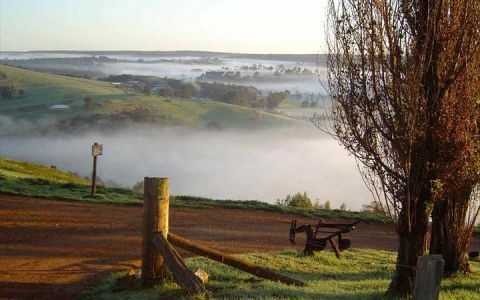 Misty View Cottage has an elevated and spacious balcony with spectacular views overlooking the magical town of Balingup. Enjoy stunning sunrises as the mist settles in the valley below. Perfect for couples looking for a secluded getaway. Cosy and comfortable with full insulation and a wood fire, Misty View Cottage sleeps 2 people in a Queen size bed. Additional people can be accommodated on fold out beds if required - please contact us for details. Misty View is fully self-contained. Air conditioning, a cosy wood fire, electric blankets, crisp freshly laundered linen and guest towels plus complimentary tea and coffee all add to the home comforts. One bedroom with q/s bed plus a sofabed in the living area which can accommodate a single adult. Ideal for families & walkers, this cottage has sweeping views and has 2 bedrooms (one Queen, one twin share); sleeps up to 4 persons. 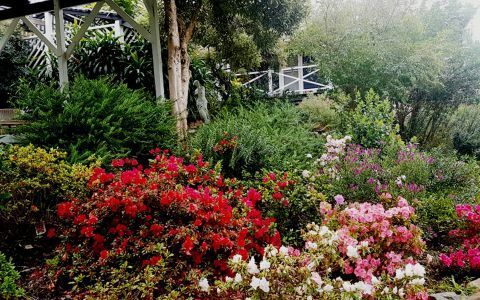 Red Gum Cottage has a large balcony, with panoramic views east, south and west, where you can sit and watch the spectacular afternoon sunsets. An additional person can be accommodated on a fold out bed - please contact us for details. 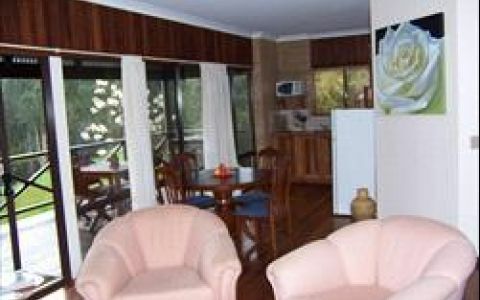 Red Gum Cottage is fully self-contained and provides TV/DVD, CD player, microwave, fridge, gas top cooking and BBQ. Air conditioning, a cosy wood fire, electric blankets, crisp freshly laundered linen and guest towels plus complimentary tea and coffee all add to the home comforts. A 50% deposit is required to secure your booking. This is not refundable. However in the unfortunate event of a cancellation due to an emergency the owners will be pleased to transfer the deposit to a future booking subject to availability. Cancellations made within seven days of the booking date will result in the total deposit being forfeited unless another booking can be secured. Tranquil place, kids had lots of fun in the forest and feeding the animals. We have been staying here several times and will again. Thanks to Deb and Brian. Lovely hosts, spectacular views comfy warm accommodation. We enjoyed a weekend away with our children who ran free around the forest and fed the animals. We will be back. Thank you Brian, Deb and Mia !